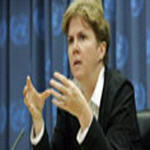 25 July 2007  A senior United Nations official today stressed that the world body is doing its utmost to get to the bottom of recent allegations of misconduct against peacekeepers in Côte d'Ivoire and the Democratic Republic of the Congo (DRC), pledging to hold all personnel to the highest standards of behaviour. "We are not turning a blind eye to any activity anywhere," said Jane Holl Lute, who is Officer-in-Charge of the Department of Field Support, a new department created to work with the Department of Peacekeeping Operations (DPKO). "When investigations are conducted and it is demonstrated that the allegations are founded, we will take action," she stated at a press conference in New York. The world body has imposed a zero-tolerance policy against sexual abuse and exploitation in response to numerous allegations of misconduct by UN peacekeeping forces around the world. Ms. Lute emphasized that zero tolerance means "zero complacency" and "zero impunity." Last week, the Moroccan contingent serving with the UN Operation in Côte d'Ivoire (UNOCI) was suspended amid allegations of sexual exploitation and abuse involving the local population. A preliminary report, submitted by the UNOCI Conduct and Discipline Team, had shown "a solid basis for investigation." The UN Office of Internal Oversight Services (OIOS) is investigating the matter and its report is expected to be finalized this week. In addition, a joint investigative team will arrive in Abidjan next week to conduct a detailed investigation into all of the allegations raised. Various allegations of serious misconduct have also been levelled recently against UN personnel serving with the world body's mission in the DRC, known by its French acronym MONUC. The UN has deployed a management audit team to look into the matter and to evaluate management processes to ensure that the Mission is aware of the activities of all its various segments. While the UN is determined to act on the findings of the investigations, she stressed that the world body is "limited" in the action it can take, adding that it relies "on our partners, the troop contributing countries." She noted that the Government of Morocco has reaffirmed its support for the zero-tolerance policy to the UN and that it remains "committed to working with us, not only through this joint investigation but following through on enforcement action and future steps ahead." "We cannot do this alone," she stressed. "We rely deeply on the troop contributing countries and the commitment of their national capitals to make this real and not just a theoretical exercise." In that regard, she announced that an extraordinary meeting with those countries will be held tomorrow at which she would request the opportunity to visit their capitals to hear their ideas, to make sure that everyone was aware of what the standards were and that commanders were carrying out their responsibilities regarding order and discipline. She stressed that the "vast majority" of peacekeeping personnel conducts themselves with dignity and respect, adding that "when one person misbehaves, it threatens the reputation of us all." The UN will work with troop contributing countries on that matter, she added. Highlighting initiatives taken by the UN to address misconduct, she mentioned that Member States had recently approved the establishment of a Conduct and Discipline Unit at UN Headquarters in her Department. In addition, a UN anti-prostitution campaign has been developed and is now ready for testing in Timor-Leste, while the General Assembly is considering a victim's assistance programme, she said.